Since I’m definitely THAT kind of person who has a strong urge to pick up curb side finds, scour the flea markets and yard sales for DIY projects, the experts on the show Buy It! Fix It! Sell It! have inspired me to do more (thank you hubby for not freaking out with things I haul home to “someday” work on). The hit show returns for a second season May 21st on HGTV Canada. In each episode top professional fixers battle over items at auction before radically revamping each piece. Creativity equals cash for these pros whoa re keen to get the lowest price on any time to turn it into a masterpiece and to make a profit. Fixers Paul “Willy” Williamson, Mike and Joe Wolchock (The Neon Brothers), Bob Krist and Tiffany Pratt return for this brand new season. We had a chance to speak with expert Mike Wolchock to get more advice since it is Spring now and I have the urge to upcycle some cool finds! Maybe even sell them off if I can get enough courage to do so! When you’re scouring auction houses or flea markets, what should we be looking for that would be great pieces to overhaul? Look for items with a bit of personality. When I’m out looking for treasure I usually stick to vintage pieces. The best finds usually stick out, and when you see them you just know. I’m not good at haggling prices… what’s the dance? Any tips? The dance is all in the negotiations, start high when buying and selling. If I offer a good price, they usually take it and I don’t come across as stingy. When selling, I always start high because everyone likes to lowball. Then I come down and get what I originally wanted for it anyway and I’m the hero!! What’s a popular DIY style that we should look into? Remember decoupage? DIY style really is an expression of the individual. I just create what I like and think looks good and hope others like it too. It seems the more I don’t care about people liking what I create, the more I see in return. If we wanted to try DIY ourselves how/where can we learn the techniques? DIY is all about personal trial and error. Every city has a good auction house and a good old school hardware store, don’t be afraid to explore these places. Beyond that all you need is money and tools. I don’t really have a favourite how-to site, but a great place to find items is Kijiji. Also, I live close to an amazing hardware store and go there pretty often, so keep an eye out for spots like that. Have you ever had a piece that you’ve repurposed and didn’t want to let go? I get attached to everything! But in the end, this is what pays the bills so I usually wind up selling my creations. Plus, half the fun is acquiring something else with the cash I just made! Can you give us an example of a piece that you’ve found at a vintage/flea market/Auction House (price, where it was located), revamped and sold that totally surprised you? I’ve bought and sold tons of stuff over the years, nothing really stands out. 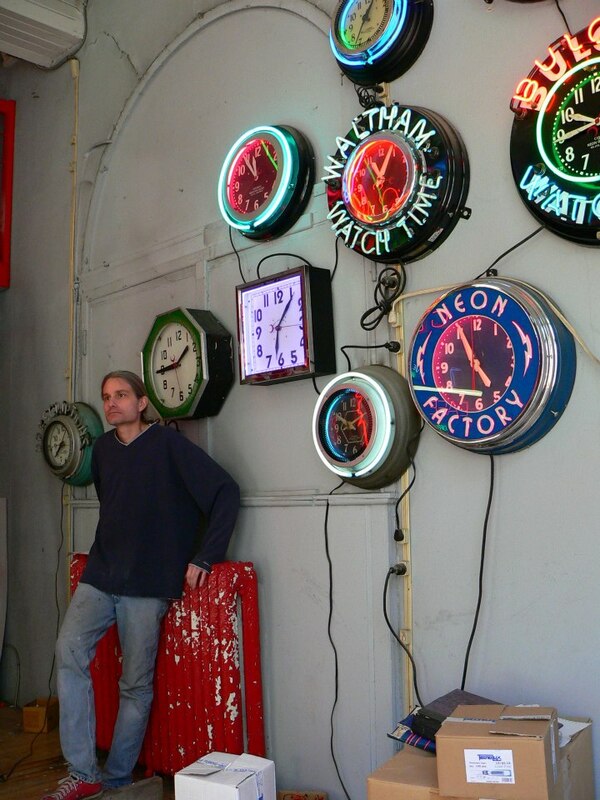 However, I do have a huge vintage neon and sign collection – these are the pieces I really cherish and don’t sell. How do you price your new pieces? I tend to price my work fairly high, but almost always get my price. Sometimes it doesn’t sell for what I planned, but that’s how the game works. What advice would you give someone who’s interested in trying this buy – fix – sell? All you need is money, patience, and a careful eye to get the ball rolling! Here’s a fun trailer for the show…I can’t wait!